I am in France spending a large part of the summer with my family at my sister’s beautiful, old, and very run down farmhouse in northern Brittany. While New York was smouldering under the heat last week everyone in France complained about the cold, and here, too, temperatures have hovered around 18°C (65°F) and it rains more often than not. But no one complains. Northern Brittany is known for blustery weather and beautiful coastlines, and we’ve been enjoying both. Food-wise, beyond crêpes and savory buckwheat galettes – Brittany’s most famous culinary exports – the region has fresh fish and seafood in abundance, is famous for artichokes and pink onions, breeds pigs, and bakes far and kouign amann for dessert. This of course being just a cursory list. We’ve been enjoying all of that, too. 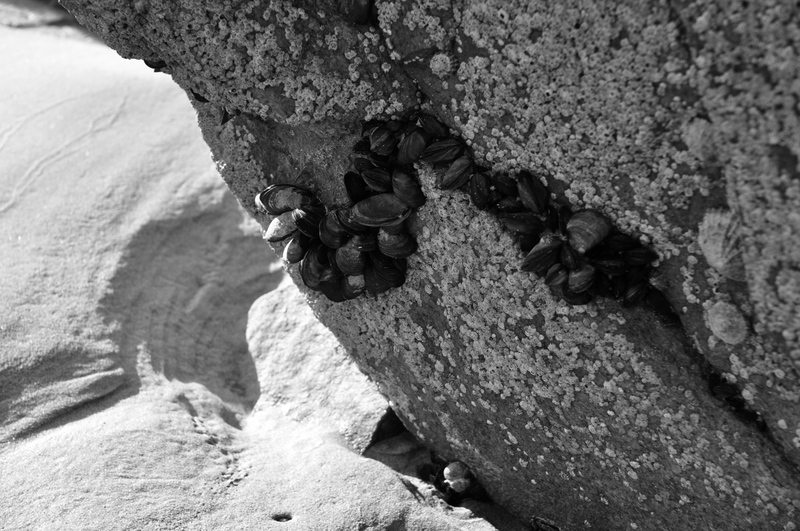 Thoroughly scrub the mussels clean, wash them under clear water, and drain. Peel and thinly dice the shallots. Peel and thinly slice the garlic. Wash and finely chop the parsley and reserve for later. In a large cooking pot, melt the butter with a dash of olive oil. Add the shallots, and cook until they become translucent. Add the garlic, stir, and cook for another minute. Throw in the sprigs of parsley and stir again to combine the flavors. The shallots shouldn’t turn brown. As soon as they start to turn golden, pour in the white wine and bring to a boil. Simmer for 4-5 minutes. Add the mussels, cover with a lid, and turn up the heat. As soon as the lid starts to let off some steam, take the pot off the fire and, firmly, with both hands, shake it with a few gentle jerks in order to turn the mussels inside the pot. Place the mussels back onto the stove for a few minutes more. Most of the mussels should be open. If not, jerk the mussels again and return to the stove. 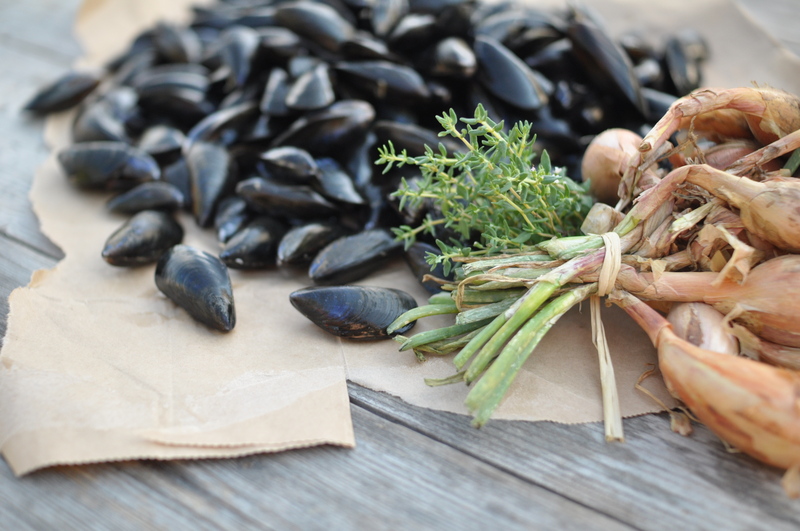 Once the mussels are open, transfer them carefully with a straining ladle to a warm pot or bowl for serving. Place the coking pot with the shallot/wine sauce back onto the fire. Stir in the crème fraîche (I prefer the sauce to become milky and not creamy, but add according to taste), and some pepper. Pour the very hot sauce over the mussels, sprinkle with lots of parsley, and serve immediately. *At home, poke breathing holes into the bag of mussels and store in the refrigerator. This entry was posted on 25 July 2011 at 12:48 and is filed under Easy, Year-round. You can follow any responses to this entry through the RSS 2.0 feed. You can skip to the end and leave a response. Pinging is currently not allowed. Thank you very much for your comment! Bigorneaux harvesting sounds great and we also go “hunting” on the seashore. Every year on the day of the lowest tide we look for clams. This year unfortunately I missed it – family, friends, and the children went, but I was away. There’s something very satisfying in getting one’s own dinner! Sounds like a wonderful summer. Such a great recipe too!